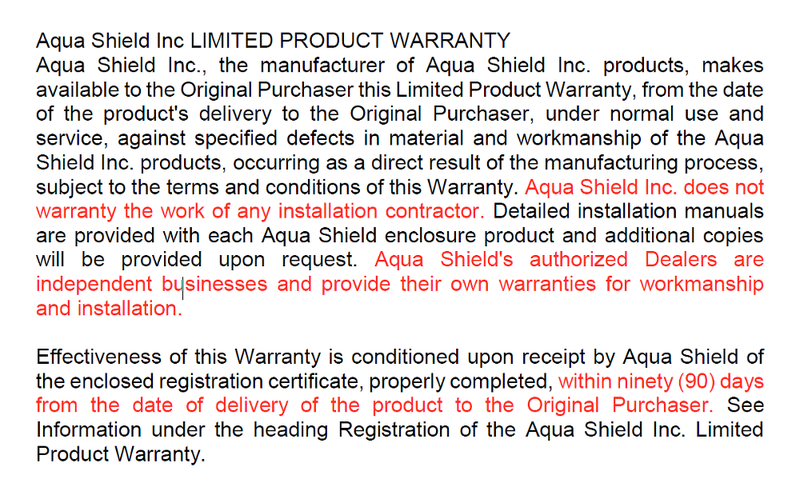 The attached warranty sheet shows exactly how Aqua Shield stands behind their products and how they handle their warranty - make an informed decision before you make an investment into an enclosure from Aqua Shield. It takes two people, one on each side to slide the enclosure simultaneously. During high wind and snow conditions the enclosure must remain in fully compressed position. This means that your pool/patio will be exposed to the outside elements! Normal weathering may cause any surface to oxidize, chalk, accumulate surface dirt, stains, etc. This Warranty does not include any labor costs or ancillary materials. CONTACT US - A BBB A+ RATED COMPANY - FOR FREE POOL ENCLOSURE QUOTE!